13th October, 1958; the first of a series of books featuring Paddington Bear is published "A Bear Called Paddington", the first story is about a bear who is found at Paddington railway station in London by the Brown family. The books are written by Michael Bond and illustrated by Peggy Fortnum. The much loved stuffed Paddington Bear toy with his Wellington boots did not appear until 1972 / 1973. Paddington Bear is a fictional character in children's literature. He first appeared on 13 October 1958 and was subsequently featured in several books, most recently in 2008, written by Michael Bond and first illustrated by Peggy Fortnum. 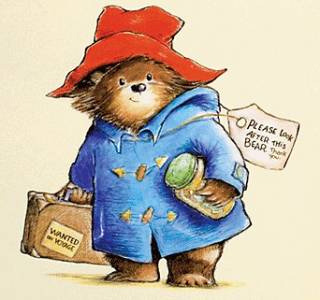 The polite immigrant bear from Darkest Peru, with his old hat, battered suitcase, duffle coat and love of marmalade sandwiches has become a classic character from English children's literature. Paddington books have been translated into thirty languages across seventy titles and sold more than 30 million copies worldwide. Over 265 licences, making thousands of different products across the United Kingdom, Europe, United States, Southeast Asia, Japan, Australia and South Africa all benefit from the universal recognition of Paddington Bear. Paddington is an anthropomorphised bear. He is always polite (always addressing people as "Mr.", "Mrs." and "Miss" and very rarely by first names) and well-meaning (though he inflicts very hard stares indeed on those who incur his disapproval). He likes marmalade sandwiches and cocoa, and has an endless capacity for getting into trouble. However, he is known to "try so hard to get things right". He is an adoptive member of the (human) Brown family, and thus gives his full name as Paddington Brown. Bond based Paddington Bear on a lone teddy bear he noticed on a shelf in a London store near Paddington Station on Christmas Eve 1956, which he bought as a present for his wife. The bear inspired Bond to write a story, and in ten days, he had written the first book. The book was given to his agent, Harvey Unna. A Bear Called Paddington was first published on 13 October 1958, by William Collins & Sons (now Harper Collins). The first Paddington Bear was created in 1972 by Gabrielle Designs, a small business run by Shirley and Eddie Clarkson, with the prototype made as a Christmas present for their children Joanna and Jeremy Clarkson (English broadcaster and writer). Shirley Clarkson dressed Paddington in Wellington boots to help the bear stand upright. (Paddington received wellingtons for Christmas in Paddington Marches On, 1964.) The earliest bears wore small children's boots manufactured by Dunlop until their production could not meet demand. Gabrielle Designs then produced their own boots with paw prints moulded into the soles. Shirley Clarkson's book describes the evolution of the toy Paddington from Christmas gift to subject of litigation and ultimately commercial success. In the first story, Paddington is found at Paddington railway station in London by the Brown family, sitting on his suitcase (bearing the label "WANTED ON VOYAGE") with a note attached to his coat which reads, "Please look after this bear. Thank you." Bond has said that his memories of newsreels showing trainloads of child evacuees leaving London during the war, with labels around their necks and their possessions in small suitcases, prompted him to do the same for Paddington. He has arrived as a stowaway coming from "Deepest Darkest Peru", sent by his Aunt Lucy (one of his only known relatives, aside from an Uncle Pastuzo who gave Paddington his hat), who has gone to live in the Home for Retired Bears in Lima. He claims, "I came all the way in a lifeboat, and ate marmalade. Bears like marmalade." He tells them that no one can understand his Peruvian name, so the Browns decide to call him Paddington after the railway station in which he was found. Paddington's Peruvian name is ultimately revealed to be "Pastuso" (not to be confused with his "Uncle Pastuzo".) Bond originally wanted Paddington to have "travelled all the way from darkest Africa", but his agent advised him that there were no bears in darkest Africa, and thus it was amended to darkest Peru, home of the spectacled bear. They take him home to 32 Windsor Gardens, off Harrow Road between Notting Hill and Maida Vale. (It should be noted that there is no number 32 in the real Windsor Gardens.) Paddington frequents the nearby Portobello Road markets, where he is known for, and respected by, the shopkeepers for driving a very hard bargain. When he gets annoyed with someone, he often gives them one of his special "hard stares" (taught to him by Aunt Lucy), which causes the person to become flushed and embarrassed.